A new Washington Post poll is out. Selected questions are shown below. 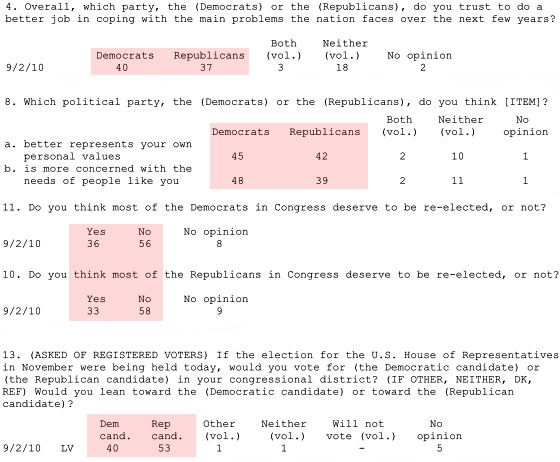 Summary: Americans trust Democrats more to handle the country’s problems, they think Democrats represent their values better, they think Democrats are more concerned with the needs of people like them, and they think Democrats deserve to be reelected at a higher rate than Republicans. They also think (though I didn’t show it below) that George Bush is substantially more to blame for our economic woes than Barack Obama. And the result of all this? They say they plan to vote for Republicans by landslide numbers. It’s the economy, stupid.